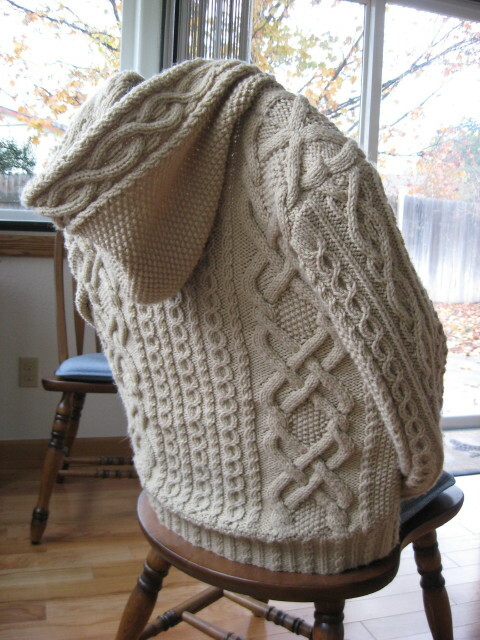 View my other FREE knitting patterns here. 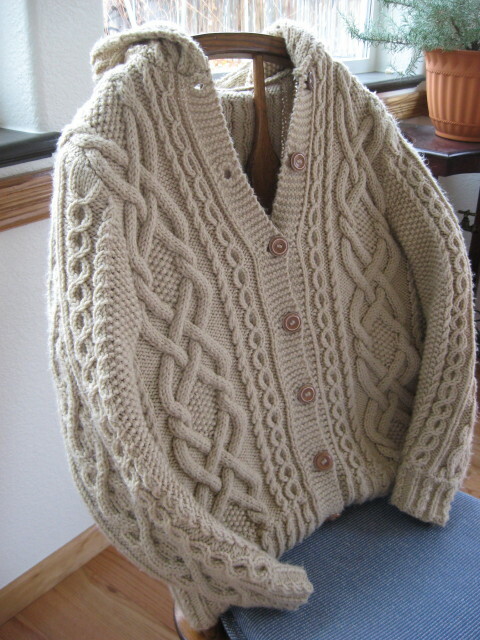 Materials: Knitting needles, sizes 6 and 8 (US); cable needle; worsted weight yarn of color desired – 30 oz. (this is just an over the top guess, since I made this many years ago and I honestly don’t remember how much yarn I bought); stitch holders; 7 large buttons. Gauge: 4 sts/inch on larger needles and in seed stitch. LBC: slip 1 st to cable needle and hold in back; k3, then p1 from cable needle. LFC: slip 3 sts to cable needle and hold in front; p1, then k3 from cable needle. BC: slip 1 st to cable needle and hold in back, k2, then p1 from cable needle. FC: slip 2 sts to cable needle and hold in front, p1, then k2 from cable needle. SBC: sl 1 st to cable needle and hold in back, k1, then p1 from cable needle. SFC: sl 1 st to cable needle and hold in front, p1, thenk1 from cable needle. Row 1: k4, p6, (k1, p1) 4 times, p6, k4. Row 2: p4, C3F, (k1, p1) 4 times, C3F, p4. Row 3: k4, p6, (k1, p1) 4 times, p6, k4. Row 4: p4, k6, (k1, p1) 4 times, k6, p4. Row 5: k4, p6, (k1, p1) 4 times, p6, k4. Row 6: p4, k6, (k1, p1) 4 times, k6, p4. Row 7: k4, p6, (k1, p1) 4 times, p6, k4. Row 9: k4, p6, (k1, p1) 4 times, p6, k4. Row 10: p3, LBC, LFC, (p1, k1) 3 times, LBC, LFC, p3. Row 11: k3, p3, k2, p3, (p1, k1) 3 times, p3, k2, p3, k3. Row 12: p2, LBC, p2, LFC, (k1, p1) twice, LBC, p2, LFC, p2. Row 13: k2, p3, k4, p3, k4, p3, k4, p3, k2. Row 14: p2, k3, p4, LFC, p2, LBC, p4, k3, p2. Row 15: k2, p3, k5, p3, k2, p3, k5, p3, k2. Row 16: p2, LFC, p4, LFC, LBC, p4, LBC, p2. Row 17: k3, p3, k5, p6, k5, p3, k3. Row 18: p3, LFC, p4, C3B, p4, LBC, p3. Row 19: k4, p3, k4, p6, k4, p3, k4. Row 20: p4, LFC, p2, LBC, LFC, p2, LBC, p4. Row 21: k5, (p3, k2) 4 times, k3. Row 22: p5, LFC, LBC, p2, LFC, LBC, p5. Row 23: k6, p6, k4, p6, k6. Row 24: p6, C3F, p4, C3F, p6. Row 26: p5, LBC, LFC, p2, LBC, LFC, p5. Row 27: rep row 21. Row 28: p4, LBC, p2, LFC, LBC, p2, LFC, p4. Row 29: k4, p3, k4, p6, k4, p3, k4. Row 30: p3, LBC, p4, C3B, p4, LFC, p3. Row 31: k3, p3, k5, p6, k5, p3, k3. Row 32: p2, LBC, p4, LBC, LFC, p4, LFC, p2. Row 33: k2, p3, k5, p3, k1,p1 , p3, k5, p3, k2. Row 34: p2, k3, p4, LBC, k1, p1, LFC, p4, k3, p2. Row 35: k2, p3, k4, p3, (p1, k1)twice, p3, k4, p3, k2. Row 36: p2, LFC, p2, LBC, (p1, k1)twice, LFC, p2, LBC, p2. Row 37: k3, p3, k2, p3, (k1, p1) three times, p3, k2, p3, k3. Row 38: p3, LFC, LBC, (k1, p1)3 times, LFC, LBC, p3. Repeat rows 1-38 for pattern. Row 2: sl 4 sts to cable needle and hold in back, k1, then slip the last 3 of the sts on cable needle back to left hand needle; then (before knitting the sts) bring cable needle with the last st to front between needles, passing to the left of the yarn; then knit the 3 sts from left hand needle; then knit the last stitch from cable needle. Rows 3 and 5: p5. Rows 4 and 6: k5. Row 1: k2 ,p1, k2, p2, k1, p2, k2, p1, k2. Row 2: p2, k1, p2, sl next 3 sts to cable needle and hold in back, k2, then sl the purl st from cable needles back to left-hand needle and purl it, then k2 from cable needle; p2, k1, p2. Row 4: p2, SFC, BC, p1, FC, SBC, p2. Rows 5 and 7: (k3, p3) twice, k3. Row 6: p3, work BC but knit all 3 sts, p3, work FC but knit all 3 sts, p3. Row 8: p2, BC, SFC, p1, SBC, FC, p2. Rows 9 and 11: k2, p2, k2, p1, k1, p1, k2, p2, k2. Row 10: p2, k2, p2, k1, p1, k1, p2, k2, p2. Row 12: p2, FC, SBC, p1, SFC, BC, p2. Rows 13 and 15: rep rows 5 and 7. Row 14: p3, work FC but knit all 3 sts, p3, work BC but knit all 3 sts, p3. Row 16: p2, SBC, FC, p1, BC, SFC, p2. With smaller needles, cast on 51 sts. Row 1: K7 (for front band), *k1, p2, k2, p2; rep from *, end k1, p1. Row 2: k1, p1, *k2, p2, k2, p1; rep from * to last 7 sts, k7. Row 3: k7, *k1, p2, tw2R, p2; rep from *, end k1, p1. Repeat these 4 rows four more times for ribbing. AT THE SAME TIME, make first buttonhole on row 7 of front band sts by binding off center three sts of front band sts (and then casting on three sts on following row). REPEAT buttonholes every 22 rows of front band. Row 1: (k1, p1) 3 times, p2, work row 1 of Double-X Cable, p2, k2, work row 1 of Coin Cable, k2, p1, k7 (buttonhole band). Row 2: k7, k1, p2, work row 2 of Coin Cable, p2, tw2R, work row 2 of Double-X Cable, tw2R, (k1, p1) 3 times. Row 3: (k1, p1) 3 times, p2, work row 3 or Double-X Cable, p2, k2, work row 3 of Coin Cable, k2, p1, k7 (buttonhole band). Row 4: k7, k1, p2, work row 4 of Coin Cable, p2, k2, work row 4 of Double-X Cable, k2, (k1, p1) 3 times. These four rows set pattern. Continue to work even in set pattern until piece measures 15 inches. Keeping in pattern, bind off 4 sts at armhole edge. Work one row even, then bind off three sts at armhole edge, then decrease 1 st at armhole edge on following alternate rows 2 times. (46 sts). Work even until armhole measures 7 ½ inches. Bind off 14 sts at neck edge. Work one row. Bind off 2 sts at neck edge, then dec 1 st at neck edge of next 2 right side rows. Work even until armhole measures 9 inches. Row 1: p1, k1, *p2, k2, p2, k1; rep from * across to last 7 sts, k7 (button band). Row 2: k7, *p1, k2, p2, k2; rep from *, end p1, k1. Row 3: p1, k1, *p2, tw2R, p2, k1; rep from * across to last 7 sts, k7 (button band). Row 1: K7 (button band), p1, k2, work row 1 of Coin Cable, k2, p2, work row 1 of Double-X cable, p2, (p1, k1) 3 times. Row 2: (p1, k1) 3 times, tw2R, work row 2 of Double-X cable, tw2R, p2, work row 2 of Coin Cable, p2, k1, k7. Row 3: K7 (button band), p1, k2, work row 3 of Coin Cable, k2, p2, work row 3 of Double-X cable, p2, (p1, k1) 3 times. Row 4: (p1, k1) 3 times, k2, work row 4 of Double-X cable, k2, p2, work row 4 of Coin Cable, p2, k1, k7. With smaller needles, cast on 87 sts. Row 1: p1, k1, *p2, k2, p2, k1; rep from * to last st, p1. Row 2: k1, *p1, k2, p2, k2; rep from *, end p1, k1. Row 3: p1, k1, *p2, tw2R, p2, k1; rep from * across to last st, p1. Repeat these four rows 4 more times. Row 1: (k1, p1) 3times, p2, work row 1 of Double-X Cable, (p2, k2, work row 1 of Coin Cable, k2) three times, p2, work row 1 of Double-X Cable, p2, (p1, k1) three times. Row 2: (k1, p1) three times, tw2R, work row 2 of Double-X Cable, tw2R, (p2, work row 2 of Coin Cable, p2, tw2R) three times, work row 2 of Double-X Cable, tw2R, (p1, k1) 3 times. Row 3: (k1, p1) 3times, p2, work row 3 of Double-X Cable, (p2, k2, work row 3 of Coin Cable, k2) three times, p2, work row 3 of Double-X Cable, p2, (p1, k1) three times. Row 4: (k1, p1) three times, k2, work row 4 of Double-X Cable, k2, (p2, work row 4 of Coin Cable, p2, k2) three times, work row 4 of Double-X Cable, k2, (p1, k1) 3 times. These four rows set up pattern. Continue to work even in pattern until piece measures 15 inches. Work even until armhole measures 9 inches. Bind off. Row 1: p1, (p2, k2, p2, k1) 5 times, p1. Row 2: k1, (p1, k2, p2, k2) 5 times, k1. Row 3: p1, (p2, tw2R, p2, k1) 5 times, p1. Change to larger needles, and knit 1 row, increasing 6 sts evenly across. (43 sts). Row 1: (k1, p1, k1, p1, k1), p2, p2, work row 1 of Coin Cable, p1, work row 1 of Wave Cable, p1, work row 1 of Coin Cable, k2, p2, (k1, p1, k1). Row 2: (k1, p1, k1, p1, k1), tw2R, p2, work row 2 of Coin Cable, k1, work row 2 of Wave Cable, k1, work row 2 of Coin Cable, p2, tw2R, (k1, p1, k1). Row 3: (k1, p1, k1, p1, k1), p2, k2, work row 3 of Coin Cable, p1, work row 3 of Wave Cable, p1, work row 3 of Coin Cable, k2, p2, (k1, p1, k1). Row 4: (k1, p1, k1, p1, k1), k2, p2, work row 4 of Coin Cable, k1, work row 4 of Wave Cable, k1, work row 4 of Coin Cable, p2, k2, (k1, p1, k1). These 4 rows set pattern. Continue working in pattern, increasing 1 st each side of next and every following 4th row, until there are 75 sts on needle. Work even until sleeve measures 16 inches. Keeping in pattern, Bind off 4 sts at beg of next two rows, then bind off 3 sts at beg of following two rows. Dec 1 st each side every right side row 5 times. Work next 3 rows even. Dec 1 st each side of next 4 right side rows. Bind off 2 sts at beg of next 6 rows. With larger needles, cast on 50 sts. Row 1: p2, work row 1 of Wave Cable, p2, work rem 36 sts in seed stitch (k1, p1 across). Row 2. Work 36 sts in seed stitch, tw2R, work row 2 of Wave Cable, tw2R. Row 3: p2, work row 3 of Wave Cable, p2, work rem 36 sts in seed stitch. Row 4: Work 36 sts in seed stitch, k2, work row 4 of Wave Cable, k2. These four rows set pattern. Work even until 10 repeats of Wave Cable have been made. Sew back seam of hood (the back of the hood is where the seed stitch is).